Here’s a little sunshine in a jar for you! Marinated Goat Cheese. The tangy goat cheese is mellowed by the rich olive oil and perked up with citrus & herbs. This Marinated Goat Cheese takes minutes to make (but it does need to marinate) and is really kind of a “non-recipe” because you can put just about anything you’d like in these lovely little layered jars of goat cheese. I used lemon, thyme & rosemary, and a few red pepper flakes. But what about any special peppercorns you might like, other herbs, maybe other citrus? I mean go wild with anything you like! Sun Dried Tomatoes or maybe my Slow Roasted Tomatoes, Roasted Garlic, Honey & Lavender. Maybe you’d like to think about flavoring these little jars with Spanish, French, Mexican or African flavors instead of this more Mediterranean mix. And wouldn’t a jar of this Marinated Goat Cheese make just a darling little hostess gift for someone! Spread this goat cheese on crackers, toast, crostini. Drizzle it with honey or finish it with pinch of sea salt or a grind of pepper. Or might I suggest adding the slices of goat cheese to a small casserole, drizzling with the flavored olive oil & baking it at 325 F. for 15 or 20 minutes for an effortless warm appetizer? Goat cheese used to be pretty pricey, but not so much anymore. Look for it at the big box store if you have a membership or watch for coupons (often hang tags) in the grocery. Sometimes the coupons are out long before a sale, so I pick them up when I see them and then watch for the sale price to hit. To cut nice rounds of goat cheese, pull out your dental floss or a little string. Simply slide it under the log and pull each end up to the top and tighten. Just like you cut a log of cookies. By the way, if you have goat cheese that you’re afraid you won’t get to in time, marinate it and extend the shelf life by a little bit. Use a very clean, preferably sterilized jar, and very clean hands. Pour in a small amount of olive oil into the jar, maybe 1/4 inch or so. 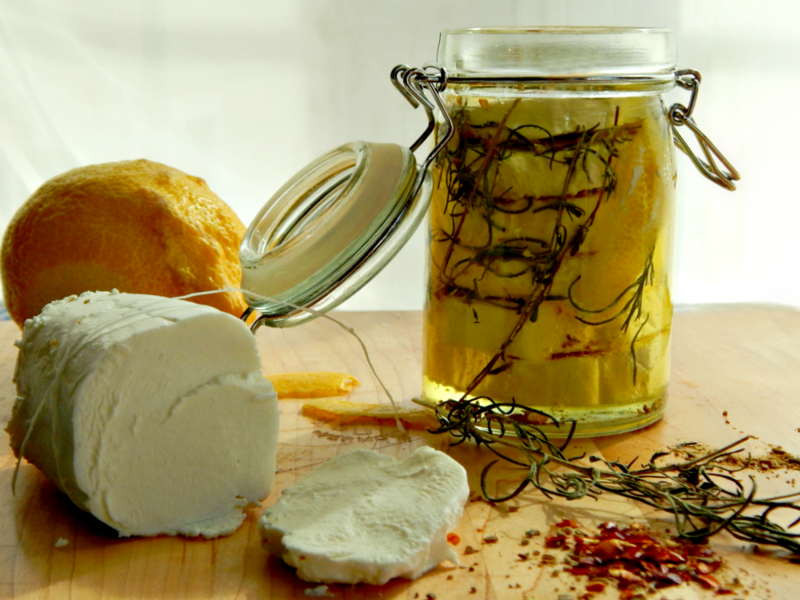 Cut the goat cheese into 1/2″ thick rounds (try cutting with string or dental floss) and place one round into the jar. Sprinkle with peppers. add another drizzle of olive oil, and continue until all rounds or gone or the jar is filled to nearly the top. Add the sprigs of thyme & rosemary and the lemon peel to the jar. Fill to the top, covering the goat cheese with the olive oil. Leave at room temperature for an hour then refrigerate for 8 hours or overnight, if you can wait that long. The longer this sits, the more flavor it will have. Marinated Goat Cheese keeps for two to three weeks, refrigerated. The olive oil may be used in cooking if it’s not too cloudy from the goat cheese. This entry was posted in Click here for Fabulous Food Posts and tagged Appetizer, Goat Cheese, Lemon, Spreads and Dips. Bookmark the permalink. I never had marinated goat cheese. That’s something I definitely want to try. Thanks for the idea! It couldn’t be simpler, as you can see! 🙂 And you’re sure welcome. I love goat cheese and it sounds even better with all the added flavors. It really is like a jar of sunshine! I love all things cheese. This looks good! Thanks, Carlee! A little cheese song for you & all cheese people! There’s no way this can not taste great! I love the herbs you chose! I think I could have a jar in the fridge all the time and just nibble on some here and there! 🙂 Thanks! Love this idea Mollie – so simple…..I may have to go and raid the Rosemary bush in the laneway behind my house! Oh, Laura, how wonderful to have a bush growing! We have to start from scratch every year! Oh I wish – I think it falls into my neighbours patch so I can’t claim any credit! This looks delicious, and so simple. I think these would make beautiful gifts, too. A friend did this last year, though he didn’t add in the herbs or spices, so I’ll recommend your link to him. Great post and photos! Well thanks! 🙂 Even with the herbs, it does really benefit from sitting for as long as you can stand to leave it, lol!! Wow, what a great idea! I’m thinking this would be a great item for my next party! Thanks for sharing this at the Fiesta Friday Link Party!!! My pleasure! And thanks for hosting!! I will probably put in even more next time, but you know me, lol! Have to try this! I love the idea – and goat’s cheese! Thanks! I love it, too! Great looking pictures. I’d love to try some of that goat cheese. How do you serve it? Love it Mollie I have to try this. Your photos are gorgeous!! !